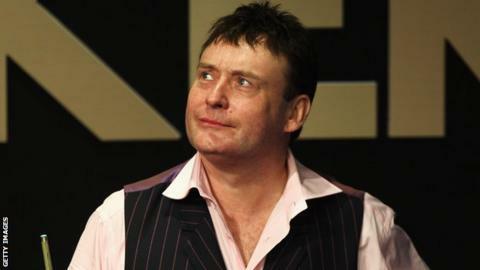 Veterans Jimmy White and Peter Ebdon both won to reach the third round of the China Open. The Whirlwind, 51, saw off fellow Londoner Alfie Burden 5-3 in part thanks to breaks of 91, 60 and 110. Ebdon edged out world number six Judd Trump 5-4 in a thrilling Beijing encounter. White, a six-time world championship finalist, said: "I needed to win my last match to stay on the tour so I'm very pleased with my performance." Elsewhere, John Higgins beat Michael White 5-1, Luca Brecel tipped out Dominic Dale 5-1, Ricky Walden saw off Xiao Guodong 5-3 and Shaun Murphy crushed Dechawat Poomjaeng 5-0. World number one Neil Robertson was a winner, beating Welshman Mark Williams 5-4, as was Ali Carter against Matthew Selt.